The human brain may be great at coming up with ideas, but it’s not always efficient at organizing such information in any meaningful way. That’s where a technique known as mind mapping comes into play, extracting information from your cranium and presenting it in a visual way that makes sense to others. MindNode 2 is capable of creating visually rich mind maps with ease. Despite a more limited feature set than rival Mac applications, MindNode Pro has long been one of the best and easiest ways to do just that. I’m happy to report its successor, MindNode 2 (Mac App Store link) has finally arrived on the scene, and it’s everything we could hope for—especially if you own the iOS version. If the very concept of mind mapping sounds daunting, MindNode 2 makes the process deceptively simple. At first, you are presented with a lone bubble in the center of the window known as a “main node,” which is used to define what your project is about. From there, child and sibling nodes can be added, each with additional details that continue to grow outward like branches on a tree. But that’s only the beginning. Version 2.0 introduces popover notes as a way to add more comprehensive information without additional screen clutter, while the new text outline option displays a more traditional breakdown alongside the mind map. Need to add more information? 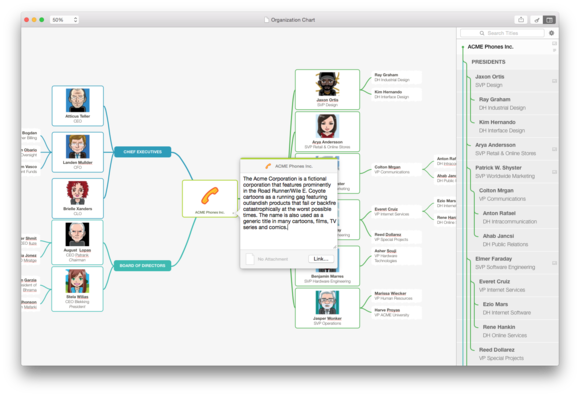 Popover notes and a new text outline view round out the impressive MindNode 2. 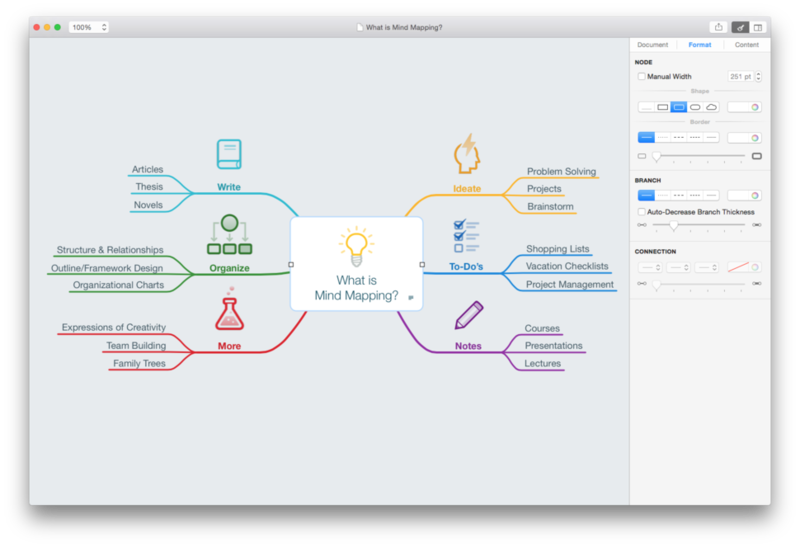 MindNode 2 includes 25 common built-in stickers in colored or tinted variations that can be used to create more visually pleasing mind maps. Photos can also be added from anywhere on your Mac using the image picker. New color themes make it easy to freshen up the look of any project with just a click, which can be customized further with background colors. The entire user interface has had a Yosemite-inspired overhaul, with an updated Inspector capable of adding shapes, borders, and strokes to nodes, branches, or connections in a variety of styles. As always, MindNode can fold, organize, or detach nodes as needed, and projects can include more than one main node. MindNode has never been restrictive when it comes to placing nodes wherever you’d like, but new Smart Layout options make it easy to create left, center, or right justified maps that can be changed on the fly. From the Document tab in the sidebar, click the desired option and watch nodes magically bend to your will, no matter how expansive the document may be. Ideas are best shared with others, and MindNode has long offered plenty of great methods for doing just that, including export to PDF, OPML, image, text, or competing Freemind formats. MindNode 2 extends this reach even further with the ability to open documents directly in Marked or export to markdown format. No matter where you need to send your mind map to, MindNode 2 has your back. 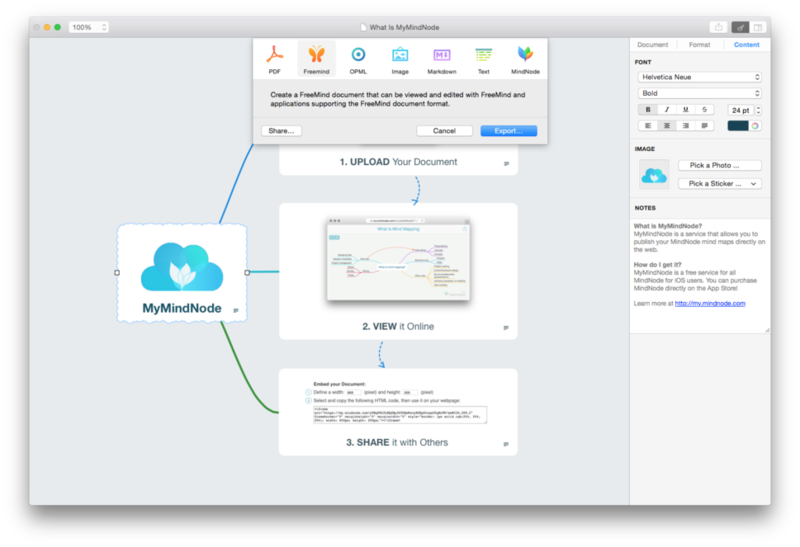 Owners of the iOS version also have the option to share documents in a more interactive way through MyMindNode, a cloud service that allows anyone with a share link to view interactive mind maps on a web browser. Once uploaded, viewers can zoom, fold nodes, download in MindNode format, or embed HTML elsewhere. It’s a slick option, but setting up a free account unfortunately requires purchasing the mobile app before it can be used on the Mac version. MindNode 2 caps off an otherwise stellar update with more comprehensive print features—documents can now be printed as either mind map or outline layouts, with the ability to optionally split each main node onto a separate page for cleaner output. 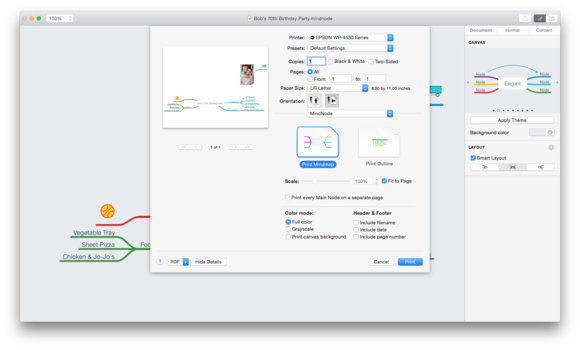 MindNode 2 offers more powerful print options, including mind map or outline mode. MindNode 2 takes what was already great about the Pro version, supercharging it with new features, themes, and other options that make it the best version yet. MindNode 2 brings mind mapping to the masses with an impressive roster of accessible, easy-to-use features.